There are artists who thrive in seclusion and there are artists who thrive in active environments. Kat Dakota, who lives in Suttons Bay, is an artist who thrives in her community. 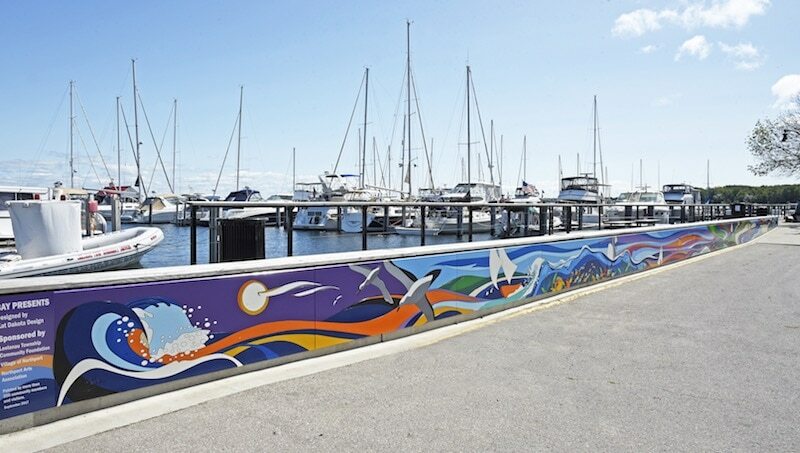 Kat encourages human connection through art, a theme represented in her mural, Bay Presents, at the Northport Marina. Born in Kentucky, Kat traveled throughout several states for her father’s career as a pastor. Her faith-filled upbringing sparked an appreciation of community and face-to-face connections. She attended college for art and changed her major to television production. Continuously resourceful, Kat taught herself photography, video editing and graphic design. As many do, she later found herself in Suttons Bay helping her mature parents. She used the opportunity to invest her time in a new area resurrecting her love for art, within her design business DoDatDakota (aka Kat Dakota Design). The mural in Northport was the perfect catalyst. Kat pursued the project because it brings engagement across generations. “I think we are losing face-to-face communication. People should learn to look up and acknowledge their neighbors,” she says. Northport remodeled the waterfront and marina six years ago. The new development left a blank space that was in need of some imagination. Fast forward to Northport searching for an artist and Kat submitting her design, which she sketched by hand and then drew digitally. The space parameters influenced her idea to create ribbons of color. She wanted to show fluidity instead of a traditional timeline. Her proposal quickly won support from the Northport Village Council, Northport Marina Committee, the Northport Arts Association, community residents and business leaders. To get the community involved, Kat thought to break the project down even more. By creating blocks of color, she assembled a system where novices and veterans could paint. 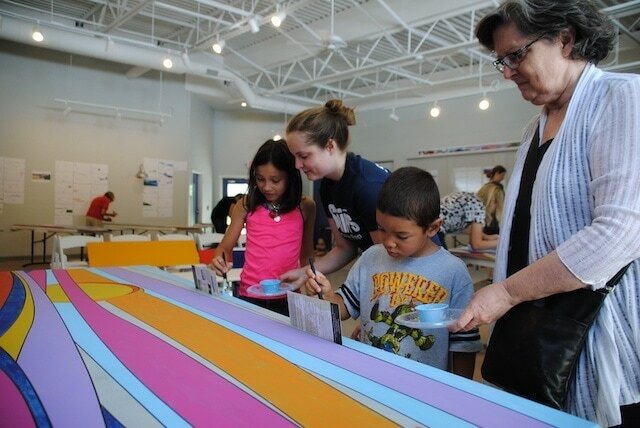 Milling the design into grooves made the project user-friendly to young and old artists who contributed to the mural—more than 200 individuals in all. The deeper beauty of this design is over time if the paint degrades, the art remains. Kat’s digital artwork originated from having minimal studio space. Without traditional canvases or easels, she creates a computer file of her hand-sketched compositions, then creates digital brushes and paints using a tablet and stylus. Her finished artwork is printed on acid-free fine art paper using archival inks. Kat’s art cannot be described as orthodox, but it’s the individuality and boldness that attracts her patrons. Her long list of skills includes promotional and marketing services, creative consultation, graphic design, computer illustration, script and copywriting, website design, digital painting, mural design and aspiring author/illustrator. Kat and her mother are currently working on a children’s poetry book inspired by the Christian creation story. Visit the harbor in Northport for an up-close view of Kat’s mural, Bay Presents. The color and life brought to the once gray space is uplifting. The geography of Northern Michigan also inspires her. The deep aquas, hard lines in the waters, rich red of the cherries and soft oranges in the peaches, all create an inspiring landscape. “Every day here segues from one beautiful moment into the next,” Kat says, an idea she reflected in the Northport mural with each picturesque scene melting into another. Kat believes people are recognizing the value art brings to a community. With quality public art and design, people are seeing and understanding how place-making creates destinations that lift local economies. 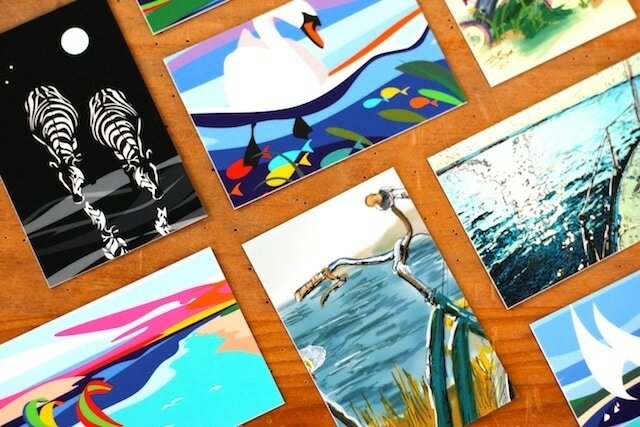 Bay Presents giclée prints, paintings and creative reproductions are available at The Sleeping Bear Gallery in Empire. You can also find Kat’s digital paintings at the Shoreline Arts Gallery in Suttons Bay.